Filmed live in Israel. Learn about the land and meet Bible personalities whose stories and struggles you'll relate to. You and your group will learn, and what you see and hear is bound to spark discussion. Accompanied by a helpful leader's guide. Whether you oversee a business, a church, a small group, a classroom or a family, we are convinced this seminar will make you more effective. You will see leadership in action, learn new insights and be challenged to do it just like God has said all along. When you leave you'll either be looking for a place to lead or rethinking how you are doing it now. Many couples never experience marriage the way God intended it. Why? This humorous yet discerning look at marriage identifies the major contributing factor that has made marriage a crazy institution where many on the outside want in and many on the inside want out. 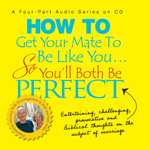 This is a different approach to an old subject with lots of practical suggestions from the creator of marriage, God Himself. We've all been given gifts. 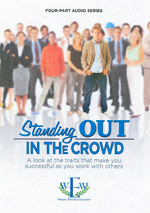 Many people have special talents, others have lots of stuff, and even more find themselves in unique and extraordinary positions. So what am I to be doing with all of that? 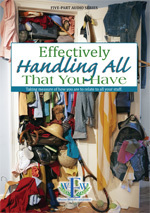 How do I know if I am handling what I've been given well, or am I using it selfishly? We have five answers that will help you live peacefully with what you've got. Get Started. Get Back. Keep Going. The prophet Isaiah encouraged us to “seek the Lord while He may be found”. 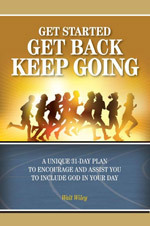 In order to encourage you to be doing that while at the same time assist you in the process, Winning With Encouragement has produced this book containing 31 days of personal devotions with the Lord. This unique publication, created by Walt Wiley, is designed to help you include God in your day. A unique collection of stories that illustrate the effects our words have on seemingly average situations. 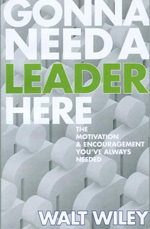 Best-selling author Ken Sutterfield is convinced that encouragement is the key to happier lives. Includes "Facing Storms in Our Lives", "How to Spot a Christian", "Struggling With Prayer", "What It Means to be a Christian", "What Robs Us of Our Passion", "What Really Matters to God", "The Man Who Was Different," "A Man and His Family," and "Here He Comes ... Again." Choose the link below for the complete listing of Walt's talks.